These are gluten free, but everyone love them! 1Preheat the oven to 350 degrees F. and prepare a 9 x 13 baking dish by lining it with foil and then spraying it with cooking spray. 2In a small saucepan, melt the chocolate chips and the coconut oil together. Remove from heat and allow to cool as you do the next step. 3Beat the eggs, sugar and vanilla until light and fluffy. 4Add the melted chocolate mixture and mix well. 5Next, blend in the cocoa powder, corn starch and salt. Combine well into a thick batter. 6Pour the batter into the prepared pan and spread evenly. Bake for 25-35 min. 7Remove from the oven and let cool slightly for a few minutes before removing from the pan with the foil. Cool completely then cut into squares and serve! 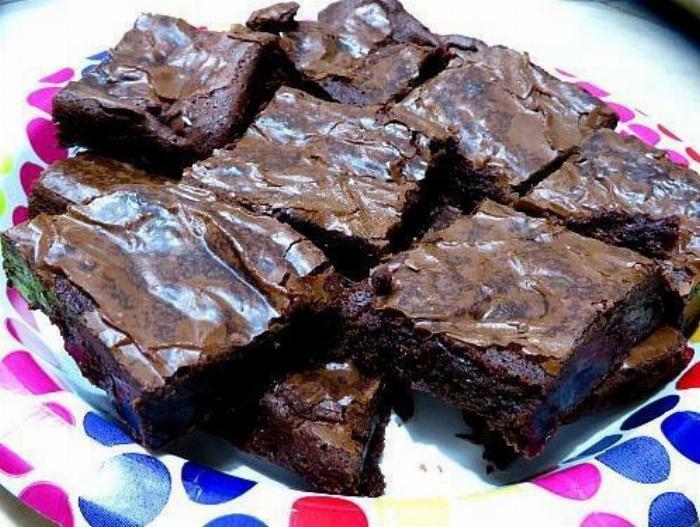 These brownies are so good, they don't really need frosting, so if you want some, just do a drizzle. I don't like to hide the crackle top. *You can substitute gluten free flour for the cornstarch.